The Tokyo Motor Show (東京モーターショー) is a biennial auto show held in October–November at the Tokyo Big Sight, Tokyo, Japan for cars, motorcycles and commercial vehicles. Hosted by the Japan Automobile Manufacturers Association (JAMA), it is a recognized international show by the Organisation Internationale des Constructeurs d'Automobiles, and normally sees more concept cars than actual production car introductions which is the reason why the auto press see the show as one of the motorshow's big five (along with Detroit, Geneva, Frankfurt and Paris). The show, originally called All Japan Motor Show was first held in an outdoor venue called Hibiya Park, the show was considered a success with 547,000 visitors over ten days and 254 exhibitors displaying 267 vehicles, but of the number of vehicles only 17 of them were passenger cars as the show was dominated by commercial vehicles. In 1958, due to construction of a subway and underground parking lot near Hibiya Park, the show was shifted to the Korakuen Bicycle Racing Track. The show, as the previous year was marred by heavy rain, in 1959 the event moved indoor to its newly opened Harumi Showplace venue which was three times the size of its previous venue. Onward from 1973, as the organisers decided not to host a show for the following year due to the international energy crisis and the show became a biennial event. The show relocated to its current venue, the convention and exhibition center Tokyo Big Sight in 1989 and due to high public demand for vehicles in everyday use and the fact concept cars dominate the show, the show returned to being an annual event from 2001 to 2005 with a show for passenger cars and motorcycle and another for commercial vehicles for the following year. However, from 2007 onwards the event has once again returned to a biennial schedule which combines both passenger and commercial vehicles, including motorcycles and auto parts. The first Tokyo Motor Show was held in Hibiya Park from April 20 to April 29, 1954. Of the 267 vehicles on display, only seventeen were passenger cars, which reflected the paucity of personal family transport in Japan at the time. Trucks, buses, and motorcycles made up most of the exhibits. Approximately 547,000 visitors attended the show over the ten days, where the most prominent cars were the Austin A40, Hillman Minx and the newly introduced Renault 4CV, as well as domestic vehicles such as the Prince Sedan AISH, Toyota Toyopet Super RH; Datsun Passenger Delux (Model DB-5), Ohta Sedan and Van, and three-wheeled vehicles from Daihatsu. The second Tokyo Motor Show was held over twelve days, beginning on May 7, 1955. Almost 785,000 visitors attended, among them HIH Prince Akihito. The highlights of the passenger cars on display were the new Datsun 110, Toyopet Crown RS and Toyopet Master RR. Passenger cars began to assume the greatest prominence at the third Tokyo Motor Show which opened on April 20, 1956, thanks in great part due to an initiative spearheaded by the Ministry of International Trade and Industry called the "people's car plan". Although its stated target of a four-seat car capable of 100 kilometres per hour and available for ¥150,000 was unrealistic — despite being twice the national average income at the time, it was still only one fifth of what a typical vehicle cost — it was given credit as the spur for domestic automakers to strive to lower their prices. Although only 527,000 people visited the fourth show between May 9 and May 19, 1957, significant vehicles made their debut; the first of the long running Toyota Corona and Prince Skyline were introduced, as well as a prototype of the Datsun Sports. The 1959 show opened on October 24. Notable premiers included Mitsubishi's first own passenger car, the Mitsubishi 500. It was held from April 20 to April 29, 1954. It was held from May 7 to May 18, 1955. The Second All-Japan Motor Show was held in 1955 at Hibiya Park, the same venue as the previous year. The show was extended to 12 days. Exhibitors still focused on commercial vehicles, such as trucks, that year. Notably, in the light-duty truck category, advanced models were displayed, including Toyota's 4-wheel light truck SKB (1,000cc engine) which will be renamed as Toyoace in 1956, Nissan's Datsun 120 Truck and Fuji Seimitsu's 1.5-ton class 4-wheel truck. These models featured both excellent driving performance and handling stability that well outperform conventional 3-wheel light trucks. New passenger cars also were presented on the motor show's stages. Toyota unveiled its 1.5-liter engine class small cars such as Toyopet Crown and Toyopet Master, while Nissan's Datsun 110 (860cc engine) also made its debut. These cars were signs of the start of the motorization of Japanese society with made-in-Japan brands. Meanwhile, the Imperial Prince visited the motor show for the first time. It was held from April 20 to April 29, 1956. The Third All-Japan Motor Show was held in 1956 at Hibiya Park during a 10-day period. From this year, exhibited products have been grouped by vehicle type - truck, pickup truck, passenger car, 2-wheeler, and motorcycle. This measure was taken to provide more merits for visitors because the majority of them were particularly interested in passenger cars. A poster of the motor show carried the slogan "Japanese Automobiles at a Glance!" The Ministry of International Trade and Industry (former Ministry of Economy, Trade and Industry) fueled the growing attention to passenger cars among consumers by announcing the "National Car Project" in May of the previous year. The national project included the development of a new 4-seater car that is capable of driving at 100km per hour. The Japanese government also had planned to release the national car at an affordable price range of around 250,000 yen. At that time, passenger cars were still very expensive for the general public in reality. At the same time, they had a premonition that the "passenger cars" they dreamt of would gradually be getting closer to their lives. Passenger cars became the boom of the motor show, accordingly. It was held from May 9 to May 19, 1957. The Fourth All-Japan Motor Show was held at Hibiya Park during an 11-day period from May 9. In the passenger car category, a significant improvement was found in the quality of exhibited vehicles, including the first-generation Toyopet Corona small car, Fuji Seimitsu's Prince Skyline, and the Nissan Datsun Sport prototype. In the truck category, Toyota displayed its first diesel truck (DA60), while Nissan unveiled its Nissan Junior and Nissan 581 models. Ohta also exhibited its 1.5-ton class light truck model. Meanwhile, an automobile information bureau was newly set up in the PR Center to provide extended knowledge on road traffic and vehicle design, etc. In this show, the organizer successfully provided visitors and exhibitors with an opportunity for business talks in addition to the general promotion of automobiles. It was held from October 10 to October 20, 1958. For the Fifth Motor Show, the venue was changed to the infield space of Korakuen Bicycle Race Stadium due to construction at Hibiya Park. The time period of the show was also shifted to commence from October 10. The motor show hereafter opens as an autumn event organized by the Japan Motor Industrial Federation, Inc. In the fifth show, a Technical Center (sponsored by the Society of Automotive Engineering) was created to promote technical developments of made-in-Japan automobiles, as well as a new Meeting Place for business talks. An automobile information room was also provided near the main entrance of the venue. More than 300 people visited the center per day. Although some newspapers were critical, saying that a Japanese car for the common people had not yet been produced this year either, a newly released Subaru 360 was very popular at the national event. Other vehicles which aroused interest included the Mikasa Touring 600cc engine car equipped with a torque converter, and the Crown 1,500cc diesel engine model. It was held from October 24 to November 4, 1959. The Japan Trade Center (indoor exhibition hall), located in Harumi, was newly chosen as the venue for the Sixth Motor Show. The total area of the site was nearly three times that of Hibiya, while the exhibiting space was double that of Hibiya site. The admission fee, which comes with the lottery tickets, also was raised to 50 yen per person. The number of exhibited vehicles expanded to 317 units in this year's show. In the passenger car category, Japanese automakers displayed attractive models, including the Subaru 360, Mitsubishi 500, Datsun Sports 211, and the all-new Bluebird. Toyota also presented its Mater Line equipped with Japan's first automatic transmission. The Prince Skyline featured a 1,500cc engine with a maximum output of 70 horse-power. In the truck category, The Nissan Datsun Truck G220 and many 3-wheeler models were highlighted. At the 1964 Motor Show, in September, the Nissan Fairlady 1500 (Datsun Sports 1500, SR311) and the Mazda Cosmo were introduced one month before the 1964 Summer Olympics . It was held from October 25 to November 7, 1960. It was held from October 25 to November 7, 1961. The "brilliant" Eighth Motor Show featured various sports cars and prototypes. The exhibiting area was double the space of the previous show and a South Gate was newly added. An extended exhibition time (through 8 p.m.) was introduced on two days of this year's show. The total number of visitors surpassed 900,000. The Japanese government announced the income-doubling program at the year-end of the previous year, and individual spending gradually increased. The so-called "3-C Period" was approaching the general public. People's dreams were to have a car, color TV and air-conditioner. Buoyed by the upturned economy, the star models were presented at the Motor Show. Many international products were also showcased. They were the Prince Skyline Sports Convertible designed by Michelotti, the Nissan Fairlady prototype, the Italian-style Toyopet Sports X, and the Daihatsu 700cc engine car. It was held from October 25 to November 7, 1962. The highlight of this year's Motor Show was Honda's first automobile. The company has already earned a world-class reputation in motorcycle races such as the World Grand Prix, and unveiled its two models on the stage: The Honda Sports 360 and 500. This helped the event attract one million and more visitors for the first time. The street from Ginza to the Harumi venue was congested with more than 10,000 cars going to the motor show every day and the organizer was forced to change it to a one-way street. At the same time, maritime transport was introduced between Takeshiba Pier and Harumi. The exhibiting areas were extended to accommodate a total of 410 vehicles. A Technical Center also debuted in an out-door area at the show hosted by the Japan Automotive Service Equipment Association and others. It was held from October 26 to November 10, 1963. "To respond to the coming liberalization of automobile import, Japanese carmakers displayed an array of new cars," newspapers reported in regard to the Tenth Motor Show. As part of the 10th anniversary program, the admission fee for the first day of the show was set at 500 yen (100 yen fee plus 400 yen donation for the Community Chest Center). From this year's show, two halls were provided for passenger car exhibits to help passenger cars become the stars of the motor show. A test driving course was created in the south of the exhibition area, which became very popular among visitors. This suggested that the show should include "an experience-oriented event." Many cars designed by foreign car designers were also displayed at the show. Notably, Toyo Kogyo (former Mazda Motor Corp.) unveiled its rotary engine series, which the company reportedly had a hard time to develop. The company's advanced sports car fitted with the rotary engine was finally on the stage. It was held from September 26 to October 9, 1964. Seeing market growth due to the liberalization of automobile import to be introduced in April next year, three foreign carmakers newly participated in the motor show this year. With this international move, the motor show was renamed from the All-Japan Motor Show to the Tokyo Motor Show. A press room was also created for foreign and domestic media. This year's show featured many GT and Coupe models rather than conventional 4-door sedans, which reflected the desire for sporty cars in the minds of consumers. Toyota's third-generation Corona RT40 was also displayed at the show. The Corona series and its long-time rival, Nissan's Bluebird, through their side-by-side competition in the so-called "B-C Battle" in the market, have long played a key role in the development of Japan's motorization. It was held from October 29 to November 11, 1965. A feeling that the time of high economic growth had come was in the air. The 12th Tokyo Motor Show was held immediately after the October 1 introduction of the automobile import liberalization. For this year's motor show, Japanese carmakers thus emphasized sales promotion rather than presenting showy exhibits. To cope with imported automobiles, luxury Japanese models were on display, including the President fitted with a V8 4,000cc engine, the New Cedric, and Crown V8 engine model which was previously showcased at last year's show. In the small car category, a variety of new models were unveiled in the 800-1,000cc engine class, including Japan's first fastback model, the Colt 800, the Honda S800/N800, Subaru 1000, and Familia Coupe 1000. My Cars (One's own cars), which were not used for taxi models, were also highlighted at the show. It was held from October 26 to November 8, 1966. The 13th Tokyo Motor Show was held in 1966, the year of "The first year of My Car (one's own car)." As the driving force of the development of Japan's motorization, the Nissan Sunny and Toyota Corolla were unveiled at this year's show. Other carmakers also presented their new models in the 800-1,000cc engine class, heralding the "Era of Cars for Everyone." Amid the My Car boom, minivehicles fitted with under 660cc engines also earned popularity among consumers again. New minivehicle models such as Honda's N360, the Daihatsu Fellow, and Suzuki Fronte featured significantly improved performance, resulting in a strong presence among owners of conventional minivehicles. Notably, the Nissan Prince Royal, the first made-in-Japan limousine used by the emperor and empress, was unveiled at the show. Visitors were surprised at the vehicle's overwhelming body size and engine. It was held from October 26 to November 8, 1967. The 14th Tokyo Motor Show provided an opportunity for promoting traffic safety to society. A "Traffic Safety Corner" was created on the second floor of the 8th Hall (space for passenger cars) to allow visitors to experience tests. At the 2nd Hall, another promotion was conducted concerning the importance of the helmet. Although the number of exhibited vehicles slightly decreased to 655 units, compared to the previous year, attractive vehicles were on display. Toyota's Century, fitted with a V8-cylinder 3,000cc engine, was introduced as the company's flagship model. Nissan also unveiled its Bluebird 510. The vehicle features unique exterior design without triangle windows as well as a new independent 4-wheel suspension, which also became a popular model in the U.S. later. Toyo Kogyo displayed its rotary engine cars, the RX87 and RX85, as reference models. It was held from October 26 to November 11, 1968. Japanese carmakers experienced industry-wide reorganization this year. Nissan, after the merger with Prince in 1966, announced a business tie-up with Fuji Heavy Industries. Toyota also formed a business alliance with Hino and Daihatsu. With this alliance, Hino stopped producing its Contessa passenger car and Hino vehicles vanished in the passenger car halls of the Tokyo Motor Show. As traffic safety and air-pollution became serious problems this year, the organizer provided a Safety Science Center in the 5th Hall at the motor show to promote seatbelts (with demonstration) and control of idling. A "Traffic Safety Room for Children" was also created for the first time. Among the exhibits, Toyota's Crown Hardtop (2-door model) and Corona Mark II (1600 and 1900) were the center of attraction. Other vehicles of interest included the Nissan Laurel, Skyline 2000GT powered by a V6 engine, Isuzu 117 Coupe, and Toyota's Sprinter Coupe. It was held from October 24 to November 6, 1969. The Tomei Expressway opened in March this year and the demand for high-speed driving was growing rapidly in Japan. Significant progress was seen in the performance of Japanese vehicles. The 16th Tokyo Motor Show was highlighted by an array of sports cars and vehicles for motor sports. At the same time, many show models were displayed in the futuristic "dream cars" and commuter model categories, which were developed under the key concepts of high-speed and safety. Notably, the president of the motor show Prince Takamatsu showed particular interest in such future cars displayed on the stages as Toyota's EX-I, II and III. Meanwhile, carmakers emphasized displays of technological developments at the show in response to recall problems reported in June this year. They also aggressively promoted countermeasures for some serious social issues: traffic safety and the prevention of air-pollution. It was held from October 30 to November 12, 1970. Imported automobiles participated in the 17th Tokyo Motor Show for the first time. A total of 95 imported vehicles were exhibited by 33 foreign carmakers from 7 countries. The latest designs and advanced technologies of imported vehicles helped the Japan show to have a strong international flavor. On the other hand, Japanese carmakers presented a variety of vehicles ranging from sporty models (including minivehicles) prepared for high-speed driving, cars for leisure use and city cars, as well as advanced reference models (including electric vehicles) focusing on high safety standards and low exhaust emissions. This year Toyota released the Celica and Carina onto the market, while Nissan launched its front-engine, front-wheel-drive model, the Cherry, featuring an industry-first horizontally mounted engine layout. A "Safety and Pollution Protection Center" pavilion was newly created at the show to indicate that the automotive industry has launched into the challenge to improve safety and reduce exhaust emissions. The 18th Tokyo Motor Show, the second international motor show, attracted many more visitors from overseas countries than the previous year when capital transaction was liberalized in Japan's automotive sector in April this year. Exhibits of carmakers this year also focused on the challenges and solutions for safety and low-emission vehicles to respond to increasing concerns of traffic safety, air-pollution, and traffic jams in society. As for commercial vehicles, approval for exhibition was given to the under 3-ton class and a part of special-purpose vehicles only, which resulted in a passenger car oriented show this year. It was held from October 29 to November 11, 1971. The main focus of this year's show was the technological developments of safety vehicles and emission reduction, which were also the primary targets to be addressed. It was held from October 23 to November 5, 1972. The main focus of this year's show was the technological developments of safety vehicles and emission reduction, which were also the primary targets to be addressed. The auto industry's challenging positions were highlighted throughout the show. To support this, a "Safety and Pollution Prevention Corner" was set up in the 1st Hall, while large commercial vehicles were eliminated from the exhibits again. Carmakers presented the latest technologies of low-emission vehicles, including the oxide catalyst (the three way catalyst was not available at that time) and Honda's CVCC engine, as well as Thermal Reactor technology developed by Mazda and Daihatsu. Meanwhile, visitors paid great attention to motor sport oriented cars such as a racecar specification model of the Nissan Skyline and Mazda Savanna RX-3. A lunar surface vehicle, developed jointly by Isuzu and GM, was also one of the star attraction. To commemorate the 20th anniversary, the organizer prepared special events for the Tokyo Motor Show this year. They were the "Development of Vehicles," an easy explanation display of how vehicles have progressed, and "Man and Automobiles," a review of the role of automobiles in society. It was held from October 30 to November 12, 1973. It was held from October 31 to November 10, 1975. The 21st Tokyo Motor Show, the first event after it changed to an every-other-year cycle, was held under the theme of "Life on Wheels" to present the auto industry's clear visions and attitude toward environmental issues. The Theme Pavilion put on various displays to show the broad connection of daily life and automobiles, as well as the auto industry's contribution (as an export business) to the Japanese economy. A very rare presentation was also seen to show the various relationships between life and vehicles in the earlier days through such old vehicles as the 1918 "Detroit" electric vehicle and the 1929 Sumida bus. On the other hand, carmakers displayed the latest developments in environmental technology in order to comply with emission regulations. Toyota displayed the TTC-c/TTC-V system, while Nissan exhibited the NAPS system. The duration was shortened by 3 days to 11 days compared with the previous show. The exhibiting areas were also reduced to 5 Halls, which resulted in a reduction of visitors to the below-one-million-level for the first time since the 9th motor show. It was held from October 28 to November 7, 1977. This year's show saw a rush of new model releases of Japanese vehicles, which have succeeded in meeting exhaust emission regulations. The key slogan of the industry has changed from "low-emission" to "fuel saving." Star models included: Daihatsu Charade, fitted with the world's first 4-cycle 3-cylinder engine, which achieved a fuel economy of 19km-per-liter; as well as "fuel-saving" diesel-powered passenger cars such as the Nissan Cedric, Toyota Crown, and Isuzu Florian. This year Japan became the world's No.1 vehicle exporter, fueled by the boom of small cars due to the oil crisis. There was also a sign of an outbreak of trade conflict between Japan and Europe/America. Foreign brand vehicles thus were on display in a separate hall from Japanese vehicles at the motor show this year. The latest models occupied the foreign car hall, attracting many car enthusiasts. This helped the motor show to have a strong international flavor. The theme was "Abundance Towards the 80s --Vehicles Connecting the World". It was held from November 1 to November 12, 1979. Under the theme of "Abundance Towards the 80s --Vehicles Connecting the World--," the last motor show in the 70s was colored with aggressive visions toward the next decade. Despite the tough challenges of energy saving, carmakers actively presented new technologies at the 23rd Tokyo motor show. The highlighted vehicles were mostly equipped with turbo engines or diesel engines. At the Theme Hall, under the banner of "Japanese Engine Technologies," a total of 77 engines and cut-away models were displayed, ranging from aircraft engines used in World War II to rocket engines for spaceships. The organizer paid a great deal of attention to foreign carmakers due to growing concerns of trade conflict. This was reflected in the number of exhibits at the show. Exhibited foreign passenger cars numbered 123, 27 units more than the previous show. Foreign cars were grouped by country. It was held from October 30 to November 10, 1981. The world was struggling with low economic growth and instability. Carmakers, however, displayed an array of new models, reference models, and new technologies, making the motor show much more active. A notable trend was the front-engine, front-wheel-drive (FF) layout for small cars, the lightweight body of which mated with excellent aerodynamic features and helped the small car to achieve a high level of fuel efficiency. The turbo charger was also a highlight of the motor show. Nissan pioneered the installation of the turbo engine in the vehicle lineup, while Mitsubishi Motors set up turbo engine versions in a full-scale lineup this year. Even for a 1-liter engine car, Daihatsu Charade, a turbo version, the Charade Detomaso Turbo was displayed as a reference model at this year's motor show. Meanwhile, recreational vehicles (RVs) have increased in the market in terms of both number and type. Automobiles were increasingly becoming diverse as users wanted various functions in the car. The number of exhibited vehicles was 849 units, a record-high, while the number of visitors rose to 1,114,200 people. The theme was "Vehicles: Past, Present, and Future". It was held from October 28 to November 8, 1983. Amid the world economy facing hard times over the years, Japanese domestic demand was also sluggish. Exhibitors at the Tokyo Motor Show this year, however, presented abundant displays of prototypes and reference models to visitors. These vehicles adopted new technologies which were soon to be used in production vehicles. Proactive proposals for near-future vehicles were also found in such exhibits. Exhibited foreign passenger cars increased by 50% compared with the previous motor show. Foreign exhibitors numbered 28 companies. Combined number of exhibited vehicles with Japanese vehicles totaled 945 units, an all-time high. The number of visitors reached 1,204,000 people, including 26,625 foreign visitors. In commemoration of the motor show's 25th anniversary, the Theme Hall featured "Vehicles: Past, Present, and Future." The special showcase provided displays and easy explanations of the possibility of technologies in vehicle development, as well as how the present high technologies have been developed, and how new materials and electronics would be utilized in future technology. The theme was "The Culture of Motoring: The New Generation of Vehicles". It was held from October 31 to November 11, 1985. It was held from October 29 to November 9, 1987. The theme was "Freedom of Mobility - A Taste of Real Life and Luxury". It was held from October 26 to November 6, 1989. The theme was "Discovering a New Relationship: People, Cars and the Earth as One". It was held from October 25 to November 8, 1991. The theme was "Car Innovation in Free, Natural and Comfortable Ways". It was held from October 22 to November 5, 1993. The theme was "Dream the Dream, a Car with That Feel". It was held from October 27 to November 8, 1995. The theme was "One World. One People. One Show". It was held from October 24 to November 5, 1997. The theme was "Eye to the future. Changing vehicles for the earth". It was held from October 22 to November 3, 1999. The theme was "Vehicle of Character Across the World, Building Our Future". It was held from October 31 to November 4, 2000. The theme was "Open the Door! The Automobile's Bright Future". It was held from October 26 to November 7, 2001. The theme was "Sense the Evolution - Commercial Vehicles on Stage". It was held from October 29 to November 3, 2002. The theme was "The Challenge: Driving Toward A Better Future". It was held from October 24 to November 5, 2003. The theme was "Vehicles for People. Vehicles as Partner". It was held from November 2 to November 7, 2004. The theme was "Driving Tomorrow!' from Tokyo". It was held from October 21 to November 6, 2005. The theme was "Catch the News, Touch the Future". It began on Friday, October 26 and ran for 17 days. Hybrid and electric vehicles dominated the 2007 Tokyo Motor Show. Concepts for new hybrids, plug-in hybrids, electric vehicles from Japan's leading automakers are now on display at the Tokyo Motor Show. As one example, Toyota Motor Corporation introduced its 1/X (pronounced "one-Xth") concept vehicle, a Prius-like sedan that tips the scales at a third of the weight of the Prius and obtains double the Prius' fuel economy. The vehicle cuts its weight by using carbon-fiber-reinforced plastic in its frame and boosts its fuel economy with a small plug-in hybrid powertrain that can be fueled with either gasoline or E85, a blend of 85% ethanol and 15% gasoline. Toyota's other plug-in hybrid concept, the Hi-CT, is a small, boxy, two-door vehicle aimed at young car buyers. In addition, Toyota's luxury brand, Lexus, introduced its next-generation hybrid sport utility vehicle, the LF-Xh, an all-wheel-drive vehicle powered by a V6 engine teamed up with a high-output electric motor. General Motors, Ford, Chrysler and Hyundai did not attend the show. Among the other automakers, Honda Motor Company, Ltd., unveiled the CR-Z, a "next-generation lightweight sports car" that features Honda's hybrid electric drivetrain, and the PUYO, another small, boxy vehicle, powered by a fuel cell. Honda will also unveil the one-wheeled scooter transport, the Honda U3-X. Mitsubishi Motors Corporation introduced a Beetle-like electric vehicle with in-wheel electric motors, called the i MiEV Sport, which even has a solar panel on its roof. Nissan unveiled the Pivo 2, a small electric vehicle with a lithium-ion battery pack and wheel motors. But Japanese automakers weren't the only ones unveiling clean car concepts in Tokyo. Audi arrived with its "Metroproject Quattro," a plug-in hybrid with a direct-injection, turbocharged, 150 hp (112 kW) gasoline engine mounted up front and a 30-kilowatt motor on its rear axle. The concept vehicle employs a lithium-ion battery pack that allows it to run on electric power only. Nissan Leaf exhibited at the 2009 Show. Lexus LF-A exhibited at the 2009 Show. It was held from Oct. 23 (Fri.) - Nov. 4 (Wed.), 2009. The theme was "Mobility can change the world." It was held from Dec. 2 (Fri.) - Dec. 11 (Sun. ), 2011. The theme was "Compete! And shape a new future." It was held from Nov. 22 (Fri.) - Dec. 1 (Sun. ), 2013. The theme was “Your heart will race.” It was held from October 29 (Thu)-November 8 (Sun), 2015. The theme was "Beyond the motor". It was held from October 27 (Fri.) - November 5 (Sun. ), 2017. Honda S660 "Special β #komorebi edition"
Lexus GS F "F 10th Anniversary Limited 500"
Lexus RC F "F 10th Anniversary Limited 500"
Mitsubishi eK Custom "Active Gear"
Mitsubishi eK Space "Active Gear"
^ Flammang, James M. (1994). Standard Catalog of Imported Cars, 1946-1990. Iola, US: Krause Publications, Inc. p. 164. ISBN 0-87341-158-7. ^ Büschi, Hans-Ulrich, ed. (10 March 1994). Automobil Revue 1994 (in German and French). 89. Berne, Switzerland: Hallwag AG. p. 519. ISBN 3-444-00584-9. ^ Frank Filipponio. "Tokyo Preview: Lotus Exige Scura and Stealth cross over to dark side". Autoblog. ^ Sam Abuelsamid. "Tokyo 2009: Lotus Exige Stealth, complete with soft-touch paint". Autoblog. 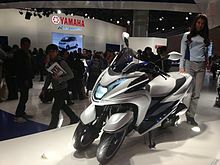 Wikimedia Commons has media related to Tokyo Motor Show.